Peerless Industrial Group provides the missing link to meet your chain related needs. For over a century, Peerless Industrial group has evolved from a small business providing tire chains to local shops to a leading manufacturer chains and chain related products in the country. Apart from chains, they also produce products for marine, traction, overhead lifting and several other areas. Four years ago Kito Americas claimed ownership of Peerless thereby providing an even larger selection of products for customers. 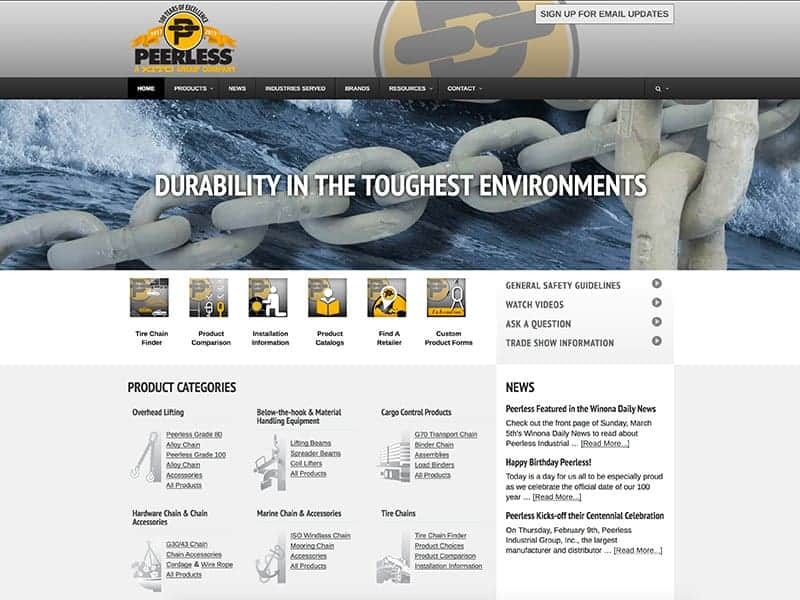 Our team worked with Peerless Industrial Group to help refine their visitor traffic on the website. Our goal was to help increase the website’s visibility in search engines and other digital marketing. The site was reorganized for easier navigation which will help customers spend less time finding products and other important resources. Pay-per-click (PCP) was used to help the overall traffic of the site. Don’t sweat over your website. Let us handle it for you!